It's the fifth day of My Life According to Pinterest's "One-derful" Birthday Bash! Today, we're giving away a Tollytots My First Disney Prince Eric! Tollytots sparks imagination, creativity and helps children to create countless playtime memories with their extensive line of dolls, accessories and preschool collections. They have partnered with some of the most trusted and recognized brands in the world – including Disney®, Fisher Price® and Graco®. Children as young as 6 months develop pretend play skills by nurturing and interacting with toys from Tollytots. 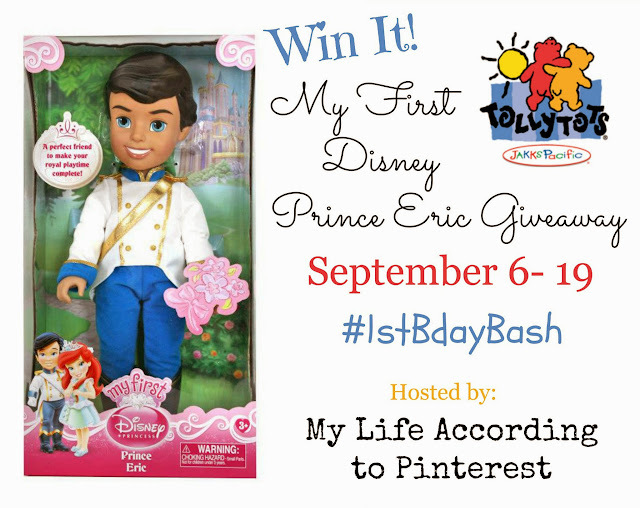 These My First Disney Prince dolls are the perfect companion to the My First Disney Princess dolls! They make for a great playtime friend! They’re also a wonderful alternative to buying a My First Disney Princess doll if your little one wants to play with a Prince! Giveaway is open to U.S. only and ends 9/19 at 11:59 pm E.S.T. The winner will have their prize sent to them by Tollytots. My Life According to Pinterest and other participating bloggers are not responsible for prize shipment.